Three new micromoths: Clockwise from top left, Eupoecilia angustana, Ancylis badiana and Cydia Succedana. Marsh Cinquefoil - Potentilla palustris - must be one of the most distinguishable flowering plants that we have. This is Chrysopilus cristatus, one of the Snipe Flies. About 1 cm. long. 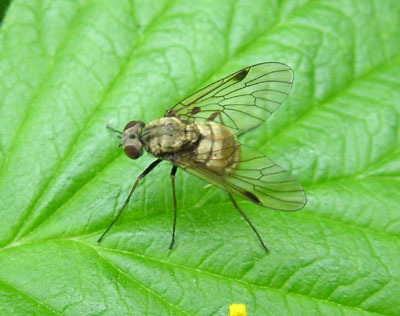 These are predatory flies that catch other insects in flight. And this is how sunrise looked at 05:20 this morning at our local stone circle.